From managing detailed operations to shaping company-wide strategies, businesses use models every day to make decisions. When faced with a problem, we use our mental models to formulate hypotheses about which cause and effect chains we can use to reach the desired results. The complexity of our mental models far exceeds our capacity to anticipate the implications of decisions based on these models. That is why Powersim's modeling and simulation tools are used to map formal mental models into models that can be simulated and analyzed on computers. Within seconds, the short- and long-term implications of our hypotheses are computed and displayed. 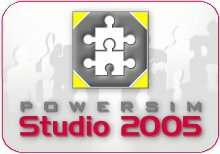 Powersim Software is proud to introduce Powersim Studio 2005, the new version of our dynamic simulation software package. Powersim Studio 2005 is Powersim Software's development environment, where you create your simulation model and perform the simulation run and analysis. Powersim Studio allows you to optimize the model as well as analyse the risks involved in your simulations. Powersim's technology has capabilities that allow for modeling of any kind of business or technical problem. You create the simulation model using our graphical modelling language, which makes the model easy to follow and explain to others. The dependencies between the variables are displayed using arrow links, and are defined mathematically in a language similar to standard cell definitions in spreadsheets. Studio allows you to exchange data with Microsoft®Excel and SAP®SEM-BPS. Once your simulation model is finished, you may present the simulation results in one of the built-in presentation controls, including graphs and charts, sliders, buttons, and more. You may also create a user interface on top of your simulation using hyperlinks, bookmarks, frames, and images. You may also perform sensitivity analysis using the built-in Risk Assessment functionality. Studio 2005 is available under different license agreements to suit the various needs of our customers. Powersim Studio SDK (Software Development Kit) allows programmers to create stand-alone applications that embed Powersim simulations. SDK-based simulators can be developed to run under Microsoft ® Windows, or in a browser environment on the Internet. The application programmer is free to take full advantage of the user interface capabilities of Windows and the Web in developing simulators with the SDK, and the resulting applications can interact with any other program or resource that is accessible in the network.